It’s February. The month of love. I hate Valentine’s Day, but this year, I will be celebrating this out of date concept and redefining it with the ritual of Self Love. Loving yourself is the practice of putting all of your energy into the relationship you have with yourself. It can be anything from treating yourself to delicious food, going on a spa day or just spending some time on your own. Changing the way you perceive yourself is a powerful form of transformation. Your self worth, confidence, letting go of regret, negative thoughts or even people can be life changing. It’s all about manifesting positive vibes. There are a lot of ways you can celebrate self love. Downing a bottle of red wine with a box of chocolates over a Netflix binge with your girl gang sounds amazing, but I am not sure how good you will feel the next day. Mindfulness and the act of self love can be achieved when you switch off from everything. The only time I can personally switch off is when I am at home and in the bath – no phone, a few candles, music and my inner thoughts to focus on. Even if it is just 30 minutes, it really helps with my wellbeing. To create a home spa atmosphere, your products need to be on point as they can really transform your experience. 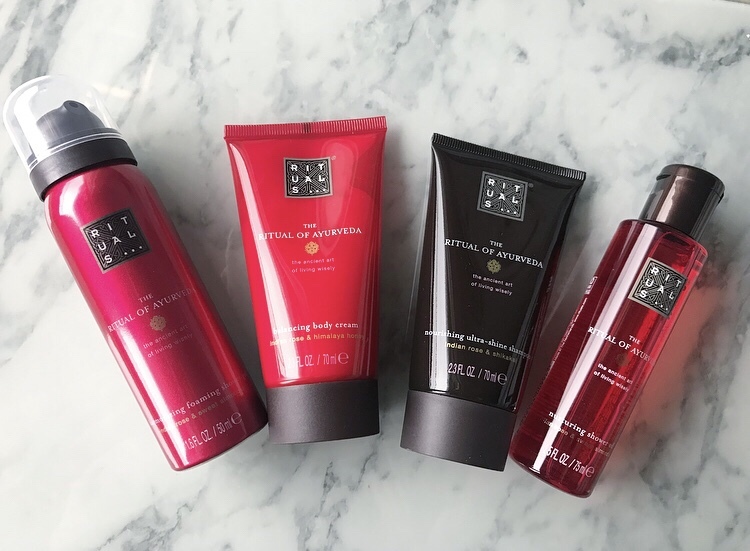 I have recently discovered Rituals, the skincare brand inspired by the wisdom and ancient traditions of Asian cultures. They have created an extensive collection of luxurious yet affordable products for the home and for the body. Rituals has a number of fragrances to lift your mood and enrich your life with luxurious and nurturing ingredients. As I only have a bath once every few months, when I have time, I thought some shower products would be more relevant as they offer small luxuries which can be achieved every morning and night. I recently tried out the Ritual of Ayurveda Balancing Treat Gift Set which is a beautiful red box containing four travel size products. Ayurveda is the ancient wisdom from India helps you to improve health and well-being by cleansing and nourishing your energy. The collection, Ritual of Ayurveda has been carefully designed to support this philosophy and offers a collection of luxury home and body care products that help balance body, mind and soul. All products contain my favourite ingredients, aromatic Indian Rose and Sweet Almond Oil to soothe the skin. Indian Rose a universal symbol for purity and love, the sweet and delicate aroma of the rose evokes positive feelings. The Sweet Almond Oil is rich in proteins and vitamins and is also mild, nourishing, and soothing. Sweet Almond Oil is said to regulate the moisture balance of your skin. The oil forms an excellent base for a body and massage oil. As soon as you open the box the scent hits you! It’s incredibly sweet and smells amazing! The Foaming Shower Gel is my favourite, it has the most intense scent, the gel to foam cleans thoroughly, feels so soft and creamy and keeps my skin hydrated. For those super cold days, when I feel that I need a little more hydration and help, the Shower Oil comes out. It’s supposed to foam once water is added but I don’t think the foam is great so I apply it directly to my skin. I finish with the Balancing Body Cream which smells equally amazing and lasts all day. It contains the Indian Rose and also Himalayan Honey, known for its medicinal properties and has a special softening and moisturising effect on the skin. I haven’t tried the shampoo yet as I have bleached hair and only use certain products on it, but I hear it’s nourishing and leaves a gorgeous almondy/rose scent everywhere you go.